The HI Travel Forum was lots of fun. Among the inspiring travelers who spoke at the event were Joyce Major from Smiling at The World and Peggy Kelsey of the Afghan Women’s Project. We also got to meet lots of interesting people as they visited our booth in between speaking events. Miguel and I will have a booth at the HI-USA Travel Workshop on Nov 19th at the Radisson Hotel in Austin, Texas. 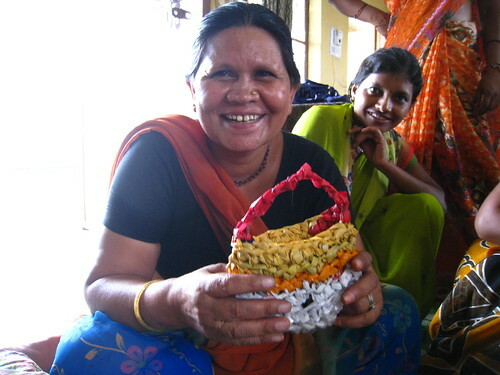 We’ll be talking about our plastic bag crochet projects, the work we’re doing in India, and visitors will get a chance to learn how to make their own plastic bag crochet creations. We’ll be hanging out at our table from about 8am-1pm, so stop by and visit us! The Travel Workshop will include workshops on various travel topics (such as web 2.0 and how to use it while abroad, conflict resolution for travelers, and voluntourism). Miguel and I presented our trip on October 6th at the Hosteling International Hostel in Austin. It was fun to compile our photos and tell our story to family, friends, and future HI travel scholarship applicants. For those of you who didn’t get to attend, here’s a pdf file of the slideshow I made. It’s more like a compilation of photos that we used as talking points, so while it doesn’t give you the whole story, it gives you a good overview of our trip and goals. My project BagsBeGone project was featured recently in FashionFad.in, an online fashion magazine. Also Food For Life Vrindavan, one of the organizations I did a crochet workshop with, wrote a little blurb about the event in their newsletter. You can click on the links below to read the full articles. Here’s a disturbing photo of a boy swimming in the Sabarmati River. 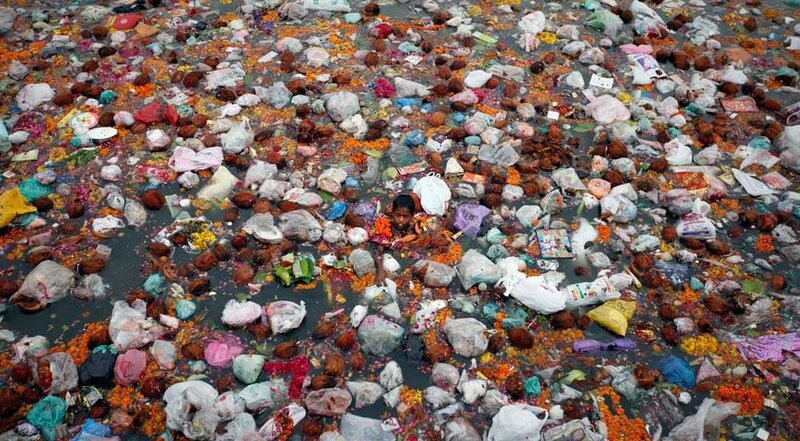 Many religious festivals and customs in India involve throwing “offerings” (often nonbiodegradable pollutants) into the rivers and seas. India is a place of stunning natural beauty, but sadly most of these places are piled high with trash. Its tough to fathom why people choose to worship their precious water sources by polluting them beyond repair. Check this link for a larger photo and caption. 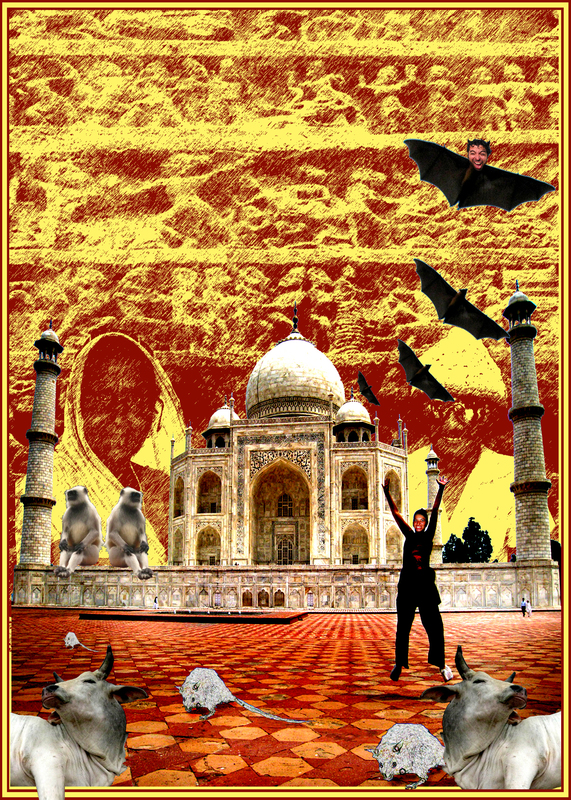 For those of you in Austin, Texas… I will be giving a short presentation about my trip to India. The presentation will be part of a welcome back session for the two Hostelling International travel scholarship recipients. 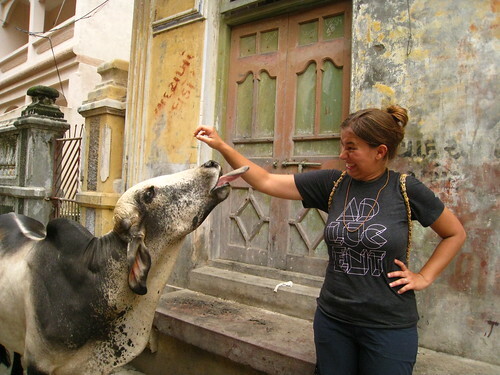 I will discuss my plastic bag crochet project, speak more generally about traveling in India, and show pictures that illustrate some of my personal highlights. This event is free and open to the public. 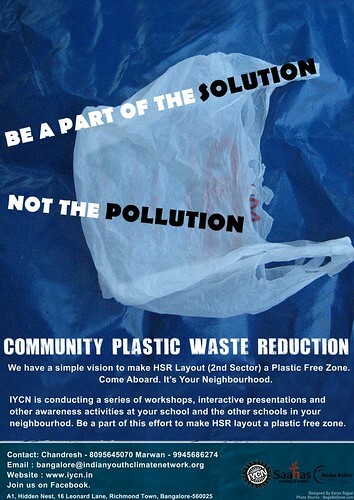 It will take place on October 6th, from 6:30-8:00. 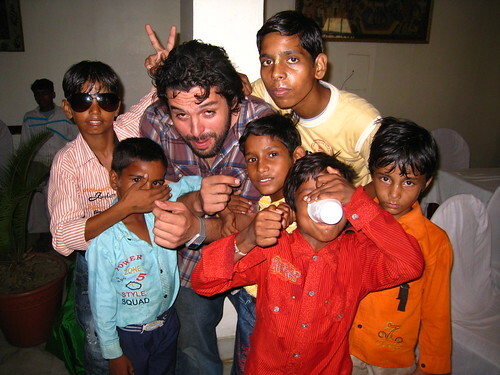 About a month ago, I wrote about our experience visiting Dharavi, a big slum in Mumbai. You can read that blog post here. 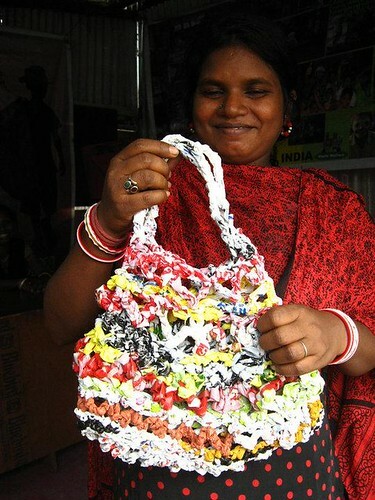 Well…Fatima of Dharavi recently crocheted her first full size bag! 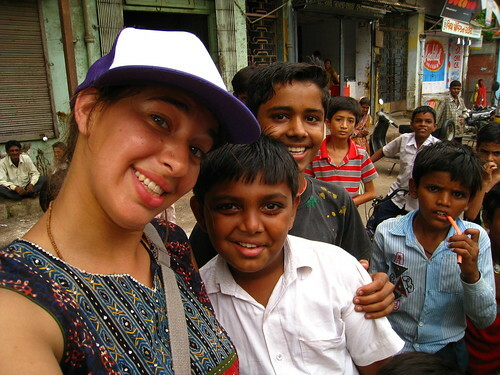 As part of Dharavi Project’s initiative to encourage creative expression among the children, some of the kids were given cameras to document their surroundings. This photo was taken by one of these kids. 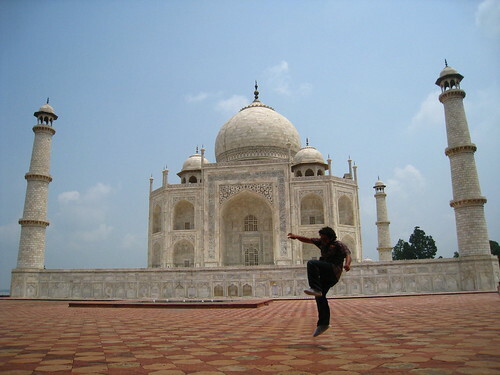 Miguel and I just returned from our 2-month trip to India! Thanks to all the wonderful people and organizations we met met along the way (and of course all the great folks back home who helped support our trip), we managed to teach 13 formal workshops, several more informal ones, and I estimate that 600-700 people learned the basics of plastic bag crochet. Check out this page for a description of our trip and our goals. Each of our workshops was unique – consisting of people with a wide range of ages, backgrounds, handicraft skills, and personal goals (for specifics about each workshop, check our “events and workshops” page). This diversity enabled us to see India from different perspectives and to gain a better understanding of some of the issues the country and its citizens are facing. 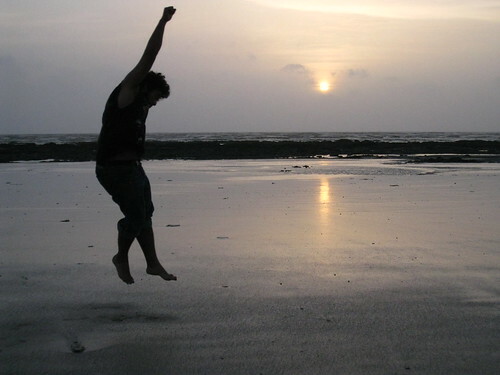 It also taught us that no matter who you are or where you’re from – certain values and aspirations are universal. 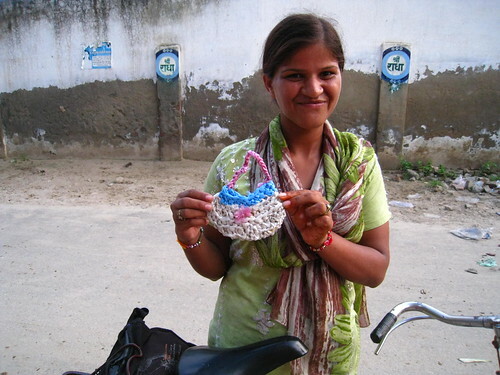 This particular trip was more about making contact with like-minded organizations, teaching plastic bag crochet to interested individuals and groups, and evaluating whether this idea can be turned into a larger project. Fortunately, the response to our idea has been even better than we expected and the results from the workshops were encouraging.